one day when I was out researching I was walking up a 4wd track when I looked over and through the bushes was a hairy creature facing the opposite way it was tall covered in hair and muscly. then u took a few steps further I looked back and saw it leaning on either side of a tree looking back at me. then I took a few steps back down the track looked back over and it was gone. Did you see it first before it saw you? Why did it turn around and face you? Did it become aware of you after you first saw it or was it trying to face away from you in an attempt to hide? Could you recall what colour the eyes were? Hi, my father has been a member of a local RFS at the foot of the Wattagan's for close to 40 years. He recounts a recent incident in which a car had broken down in the mountains, the occupants wandered down the hill looking for help, could hear something big running/walking down the hill shadowing them, they were quite worried. On getting help and returning to their car something had jumped all over the vehicle causing damage to it. millstoneridge wrote: Hi, my father has been a member of a local RFS at the foot of the Wattagan's for close to 40 years. He recounts a recent incident in which a car had broken down in the mountains, the occupants wandered down the hill looking for help, could hear something big running/walking down the hill shadowing them, they were quite worried. On getting help and returning to their car something had jumped all over the vehicle causing damage to it. 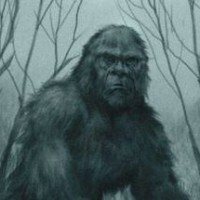 Sounds like a yowie was on a commission for a local panel beater . . . There was quite a lot of activity in the Watigans around the early to mid 2000's. Some of the old timers here may remember the Creek Bros. footage. They drove to my home here on the Gold Coast with their footage. It was good, but nothing like it was prior to them re-watching the analogue VHS tape over 200 times. Little did they know back then that each time they watched a VHS tape, it wears. The never made a copy - simply kept watching and pausing the original. They had shown some of our members of the time in the Blue Mountains, who agreed the footage was nothing less than astounding. However one person had said, after he watched the same footage after the tape was worn, that it was nothing like when he had first seen it on the fresh tape. I have the footage here and stills here in my files. Unfortunately its grainy now. It was standing behind a tree watching them from afar, having no idea they had zoomed right onto it with the camera as it stuck its head and shoulder out from time to time. It was huge. The Watigans is a definite in regards to the Yowie. Worth spending time there. Yep I've never been able to find it neither. Blurry or not, it would be great to see. It'd be really great to see that footage. I had no idea a copy was made. It's the kind of thing that's missing for us though i think but we don't need too much convincing per se. My interest and forthcoming search was starting to drift northward. I'm going to visit areas in S.A too.. across the river from Swan Reach?